For quite a while, “objective” effectiveness and efficiency had been the main features of a well-designed technology. Nowadays, personal, subjective “feelings” of competence and other experiential aspects come into the fore. Unfortunately, the relationship between objective features and experienced quality (or User Experience, “UX”) is not straightforward. This is further complicated by the call to put “experience before products”. In this view, the primary purpose of technology is not to be effective and efficient but to create enjoyable and meaningful experiences – or in short psychological wellbeing. To become successful, such an approach requires a clear understanding of what a positive experience is and how it can be created and shaped through a technology. The talk will discuss the opportunities and challenges of designing technology “to make people happy”. Dr. Marc Hassenzahl is professor for “Ubiquitous Design / Experience and Interaction” at the University of Siegen, Germany. He combines his training in psychology with a love for interaction design. 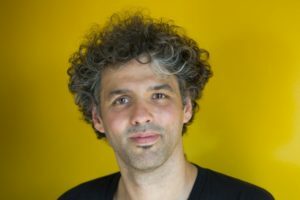 With his group of designers and psychologists, he explores the theory and practice of designing pleasurable and transforming interactive technologies. Marc is author of “Experience Design. Technology for all the right reasons” and many peer-reviewed papers at the seams of psychology, design research and interaction/industrial design.